The Ophthalmology Unit provides medical services including all range of eye medicine using the finest and most current equipment for diagnosis, laser procedures, and surgeries. The unit includes doctors in all ophthalmological fields such as cataract, retina, glaucoma, cornea, plastics and eye socket, uvea, neuro-ophthalmology, and pediatric ophthalmology. 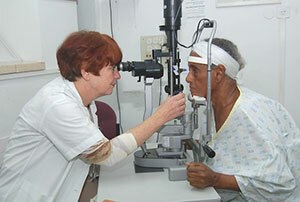 It providess a unique pediatric neuro-ophthalmology service which is one of its kind in Israel. The unit is one of the pioneering medical service providers to put into use a surgical method treating cataracts through a small incision using phacoemulsification. Innovative medical procedures and surgeries are performed such as stem cell implants into the cornea, back cornea implant, tears canal surgery using optic fiber equipment, glaucoma surgery, and complex retina surgery. This department is a major center for retina surgeries and one of the leading ophthalmology centers in Israel for innovative retina diseases and blindness prevention. The ophthalmology unit is also one of the leading departments in Israel to take part in controlled international research and is consequently involved in some of the most innovative medical treatments.